November 29, 2010 - LAN Airlines S.A. announced the signing of the definitive purchase agreement for the acquisition of 98.942% of the outstanding shares of Colombian airline AIRES. Having completed the due diligence process, LAN will acquire AIRES for US$12 million in cash, in addition to assuming net liabilities of approximately US$100 million, which include US$18 million of bank debt. This transaction will provide the opportunity for an affiliate of LAN to participate in the Colombian passenger market, one of the largest markets in South America, thus allowing for LAN and its affiliates to continue strengthening their regional presence and providing seamless service to its passengers. Ignacio Cueto, LAN?s President and Chief Operating Officer, stated ?We are very proud to announce this transaction. AIRES has made an important contribution by allowing many people in Colombia access to air travel as a means of transportation. AIRES will satisfy the foreign ownership and control requirements of each country where it operates. The company will replicate LAN?s successful and efficient ?low cost? model already operating in the domestic markets of Argentina, Chile, Ecuador and Peru, stimulating demand on domestic flights by providing more Colombian citizens the opportunity to use air transportation. 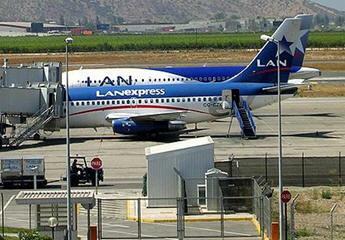 "LAN will now consolidate this growth by elevating even further the airline?s safety, quality, and service standards. We will dedicate our maximum efforts to advance this process as swiftly as possible, applying the experience and recognized capabilities of LAN, so that passengers may benefit from the changes that will gradually be incorporated to the AIRES operations.? In the medium term, AIRES will evaluate the expansion of international passenger operations and the advantages of any synergies it may obtain from LAN Cargo?s affiliate in Colombia, LANCO, launched in March 2009. LAN will dedicate its maximum efforts to ensure that the safety, punctuality and efficiency standards of its new affiliate are consistent with LAN?s own high standards. The integration process may involve certain operational changes such as itinerary modifications and efficiency improvements. This process will not interfere with the continuity of current operations of AIRES, and is expected to be completed within the next months. AIRES is the second largest operator in the Colombian domestic market with a 22% market share. As of September 2010, AIRES had operating revenues of US$190.9 million. The AIRES fleet consists of 9 B737-700s, 11 Q200 and 4 Q400, all of which are operating leases. LAN continues to provide Colombian airline AEROASIS SA with technical support and service consultancy in the process of obtaining its operating permit issued by the Colombian Civil Aviation Authority (Unidad Administrativa Especial de Aeron?utica Civil). LAN Airlines and its affiliates have a leading position in their respective domestic markets of Chile and Peru as well as an important presence in the Argentinean and Ecuadorian domestic markets. Currently, LAN Airlines and its affiliates operate one of the most modern fleets in the world, with 91 passenger aircraft. LAN Cargo and its respective affiliates have a fleet of 12 dedicated freighters. The Company has one the youngest fleets in the world which has meant greater efficiency and a significant reduction in CO2 emissions, reflecting its strong commitment to environmental protections.